It looks like I’ll be a no show. The weather has been violent with 30 mm of rain so the track is sure to be a Heavy 9 or 10. Such a shame since it’s my last day for the season. But the Racing Victoria website lists the track as Slow 6 and the sun is peeping through with no sign of a shower. So I head off with low anticipation and high trepidation. But the times for the first three races aren’t too bad, and so I rate the track on the better side of slow, probably a Dead 5.5. Almost bettable. The drainage for the Caulfield track must be amazing. In the fourth I cross nearly all of them out. Philda and Johnny Fiasco for cannon bandages, Queen Delight for some other bandage, Johannapine for the cross-over noseband, Beyond Pardon for the pacifiers. 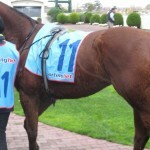 Galbraith for madly dumping with the jockey up, Forty Two Below for weaving in the stall. Eight horses and only one left, Alpha Proxima, gently munching on the bit. I back it with zero seconds to go on the tote at my limit of $1.80. 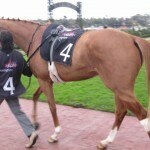 The horse falls in by half a nostril, but my bet is savaged and returns only $1.50 for the place. Mr Zelko must still be betting from his tax exile in London. In the next Reconcentrate’s shaggy coat reminded me that it was all over. No more bets. But nice to go out on a winner. I’m off to the spelling paddock now. See you in the spring. 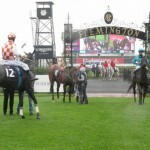 Not a good day at Flemington. 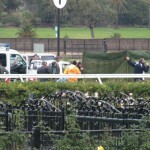 Two jockeys down and two horses put down. Mark Zahra on Sparks Burn in the third and Katelyn Mallyon on Deliver The Dream in the seventh. I feared the worse for Katelyn when they brought out the dreaded green screen and didn’t move her for half an hour, but Greg Miles eventually reported that she had regained consciousness and could speak and move her limbs, which I suppose was encouraging. Here’s hoping for a full recovery from reported facial fractures and a fractured T6 vertebra (the middle of the spine). 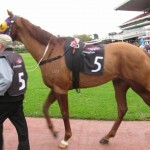 The two-year-old gelding Absolute Spirit fractured a sesamoid bone and was put down after the first race and the three-year-old gelding Sparks Burn fractured a fetlock and was put down after the third. 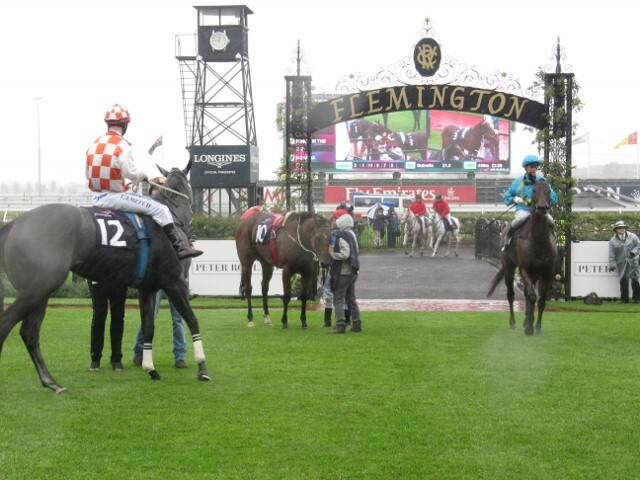 The Flemington trainer Danny O’Brien was hauled before the stewards for his comments on Twitter about the state of the track – “this is not a good surface” and that “tracks shouldn’t be cored and sliced before meetings”. Katelyn’s fall was probably the result of interference. All these falls and fractures spoilt my day. I started out well with Eximius in the first but ended up giving it back on Perturbo in the fifth and Glaneuse in the seventh. I was crooked on Ben Melham for taking Perturbo down the wrong side of the dodgy track and Glaneuse got held up by Katelyn’s fall. And the horses are getting their winter coats – which reminds me that it’s nearly time to head for a spell. But why do some trainers shear their horses in early winter? Both Streaky Fella and Azcar had been to the barbers. I reckon a shaggy coat is an excellent adaptation for a Melbourne winter. I’m going to hang onto my hair for some time yet! It’s fine and dry but with a cold westerly strafing the horse watchers. The few of us that are left that is, with stalwarts falling by the wayside. I’m armed with my booklet of free guest passes, race book, biro and drink. I give the guest passes to a deserving looking couple, who shake my hand and are eternally grateful –“we’re seniors from Perth”. My brother rings on the mobile to remind me that it is my Father’s 100th birthday. Born in the year the Titanic went down. He’s been gone some 28 years now, but it still brings me up short. I wish he could have seen what I’ve done with my life. Little action to report. 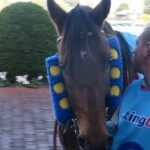 Some horrid winkers on Alrouz, which match the blue and gold spots on the jockey silks. The horse managed to get third despite them. And a double-handed ring bit hold on Inablitz. 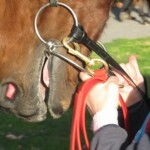 The mare was crashing into the vegetation and went out onto the track early with the clerk. She still managed fifth. 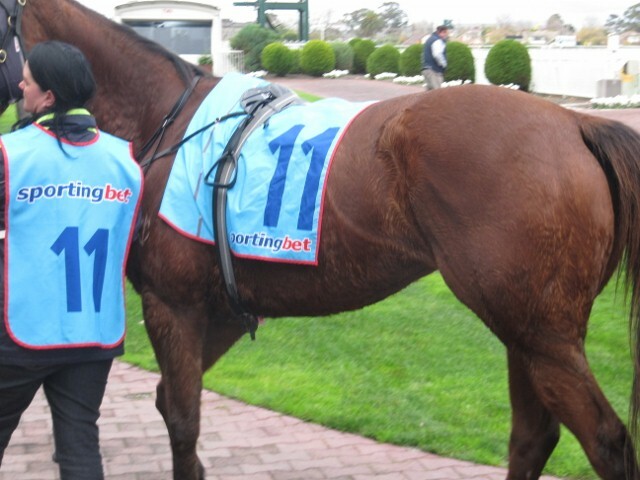 Two bets for the day, on two very relaxed horses. The Night’s Hot in the third and Utah Saints in the last. Both finished second. In fact, I was so enamoured of Utah Saints that I went and backed it again. Two out of two for the day. I finish the day with the free drink. Here’s cheers, Dad! I’m feeling quite optimistic as a Dead 5 is still quite bettable and the forecast is for fine with showers over the eastern suburbs and Flemington is clearly in the west. So no raincoat or umbrella. But I’m soon regretting it as the cloud descends in a thick fug and starts drizzling so much that Greg Miles can’t even see the two-year-olds in the first until they’ve run 300 meters. It doesn’t let up for the second and by the third, with the track downgraded to a Slow 6, I’m ready to go home. I don’t have permission to go home so I have to stick it out, not betting, being miserable and cold and wet. I wouldn’t have bet on Almodovar so I would have had an outlay of $7.00 for a return of $7.00 if I bet every race. So again, just exercising my money. Maybe I should reconsider betting on a Slow 6. Better to go home having exercised your money than simply going home cold and wet with green mould in the wallet. I took one photo, just to prove I was there.